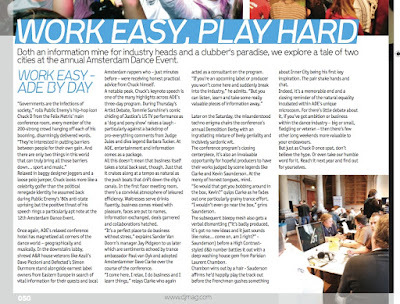 Nikki Wright, de l'Amsterdam Dance Event, m'a envoyé le PDF d'un article du DJ Mag sur l'événement. Qu'y vois-je? Mon nom! Incroyable, non? Mieux: ils appellent "Motion" un bijou de la Deep House. 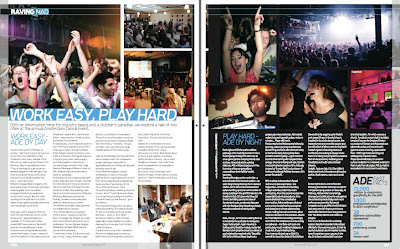 Je cite: "[...] Later on the Saturday, the misunderstood techno enigma chairs the conference’s annual Demolition Derby with an ingratiating mixture of lively geniality and incisively sardonic wit. 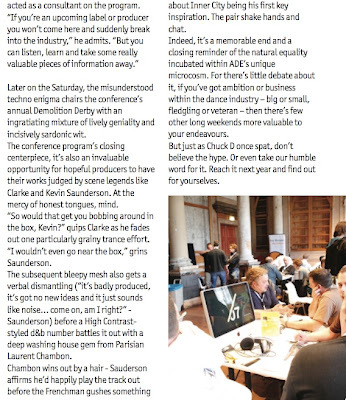 The conference program’s closing centerpiece, it’s also an invaluable opportunity for hopeful producers to have their works judged by scene legends like Clarke and Kevin Saunderson. At the mercy of honest tongues, mind. “So would that get you bobbing around in the box, Kevin?” quips Clarke as he fades out one particularly grainy trance effort. “I wouldn’t even go near the box,” grins Saunderson. 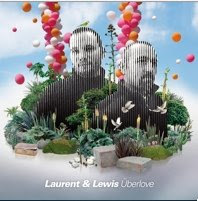 The subsequent bleepy mesh also gets averbal dismantling (“it’s badly produced, it’s got no new ideas and it just sounds like noise… come on,am I right?”- Saunderson) before a High Contrast-styled d&b number battles it out with a deep washing house gem from Parisian Laurent Chambon. Chambon wins out by a hair - Saunderson affirms he’d happily play the track out before the Frenchman gushes something about Inner City being his first key inspiration. The pair shake hands and chat. [...]"